In 2016, the EU Parliament approved the General Data Protection Regulation (GDPR), a regulation that established new rules for data protection and privacy. With the May 25th deadline fast approaching, companies around the world have started to reassess how they process and protect data to ensure they are in compliance with the EU’s new set of regulations. Basically, every company who processes any data for EU citizens will be affected. Our GDPR overview can give you helpful context on what GDPR is and how to set processes in place to ensure long-term success. How do you determine if your company is GDPR compliant? How does GDPR compliance affect my company long-term? How can I streamline GDPR documentation and processes? GDPR stands for General Data Protection Regulation, and it is a set of rules and regulations that have been established by the European Parliament to strengthen and unify data protection for EU citizens. The regulations require businesses to provide a “reasonable” level of protection for personal data and privacy of citizens when transferring or processing personal data within the EU as well as exporting data to places outside of the EU. GDPR establishes a set of customer rights regarding data and takes a broad view of what constitutes personal data, including some information not traditionally considered to be personal data within the United States (e.g. cookie data and IP addresses). How do I determine whether my company is GDPR compliant? Establish data security requirements throughout your organization for the full business process. Ensure that there are clear, permissible reasons to process personal data, for example a contract, legal consent, etc. Confirm that all third-party partners are GDPR compliant, as each partner is equally liable for breaches. Establish processes for reporting data breaches to the proper authorities within 72 hours, both internally and for third-party partners, and ensure that contracts are updated to reflect the agreed-upon processes. Implement Formal Data Privacy Impact Assessments (DPIAs) when using new technologies and for any data that poses a "high risk" to the rights and freedoms of individuals. Establish clear processes so that individuals can easily move, copy, or transfer their personal data across different services within one month of requesting it, free of charge. Establish procedures for deleting an individual’s data to support the right to be forgotten when data is no longer relevant or necessary. For large companies, designate a data protection officer to ensure compliance is maintained. Although this list is not comprehensive, it provides a general overview of some of the key compliance requirements. While the deadline is coming up fast, establishing both a long-term plan and a short-term plan for compliance will decrease the time and effort it takes to remain compliant in the long run. With new processes and procedures to put in place and a need for increased transparency on how systems process data, it’s essential to find solutions that make documentation efficient, transparent, and consistent across the organization. 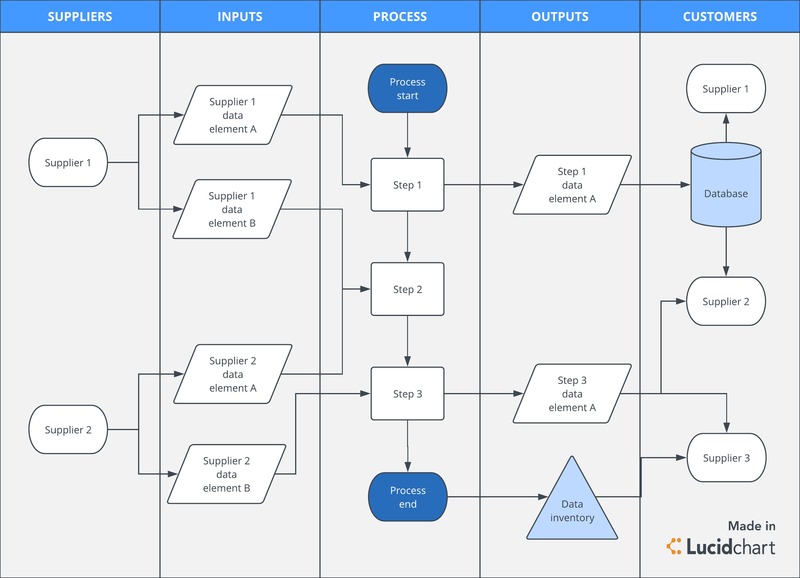 Using collaborative data flow diagrams and process flows, teams and companies can communicate essential systems and process information with clarity and ease. Lucidchart helps you create data flow diagrams that you can share with your team to divide the documentation responsibilities and give and receive real-time feedback. These diagrams can then be used as a reference to show compliance. 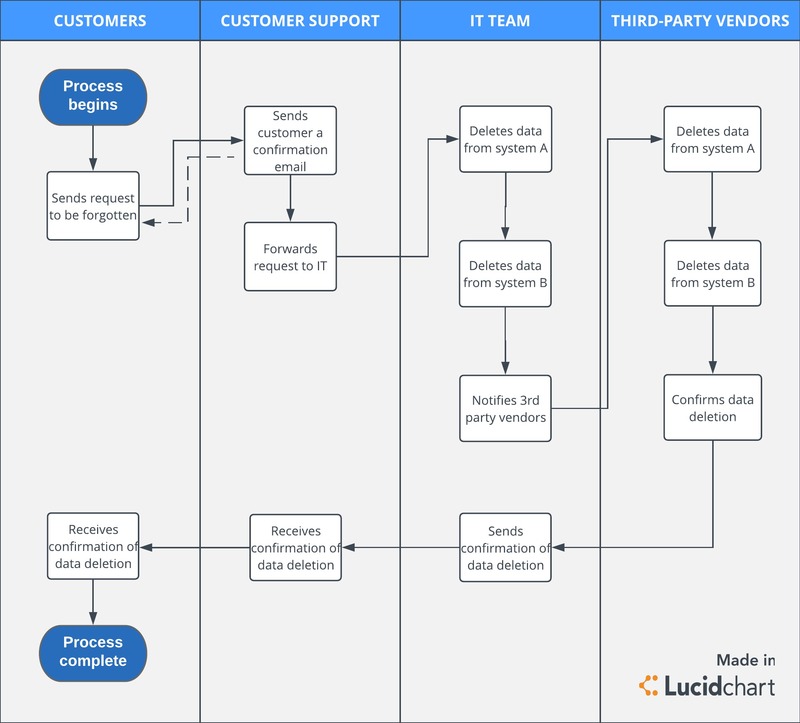 When systems change, the appropriate team members can quickly and easily access Lucidchart data flow diagrams to make sure everything stays up to date. To ensure that companies can deliver on an individual’s right to be forgotten and the right to transfer data, as well as report on data breaches quickly and efficiently, it’s important to establish clear processes that are easily accessible to the appropriate people. With Lucidchart’s intuitive drag-and-drop interface, you can easily map out processes and share them with the people who need to see them. Advanced document permission controls give collaborators have the right level of access—editing, commenting, or view-only— to ensure that process flows can only be changed by people who have editing access. Including embedded diagrams in corporate knowledge bases or document stores like Confluence can help companies to provide auditors with easily digestible overviews of company systems and processes. 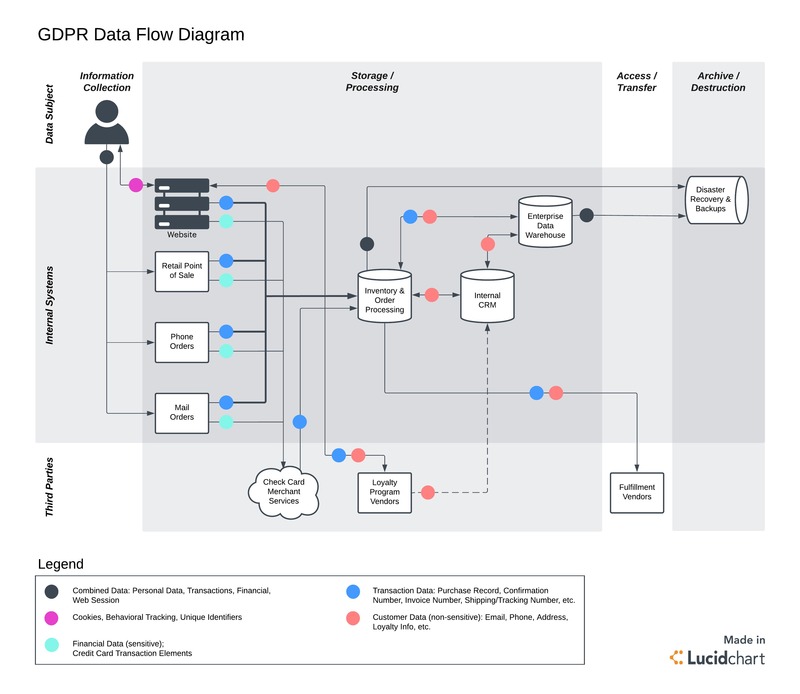 Whether you use diagrams to communicate with internal teams or establish processes with third parties, process flows can ensure that everyone stays on the same page for GDPR compliance. (Updated May 2018)—Lucidchart is GDPR compliant. To learn more about our efforts, please visit our GDPR compliance and enterprise security pages. Nathan has been working to protect Lucid and Lucid's customers since he joined the team in 2015. 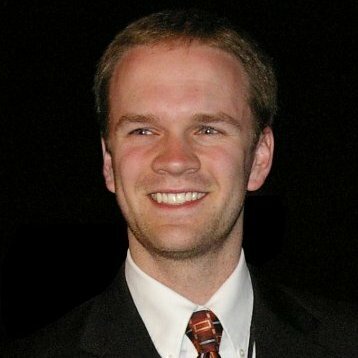 He obtained his Masters of Information Systems Management from Brigham Young University, and is a current Certified Information Systems Security Professional (CISSP).